Oneonta quarterback Taveris Hill took the opening snap 80 yards for a touchdown and the Redskins never looked back. 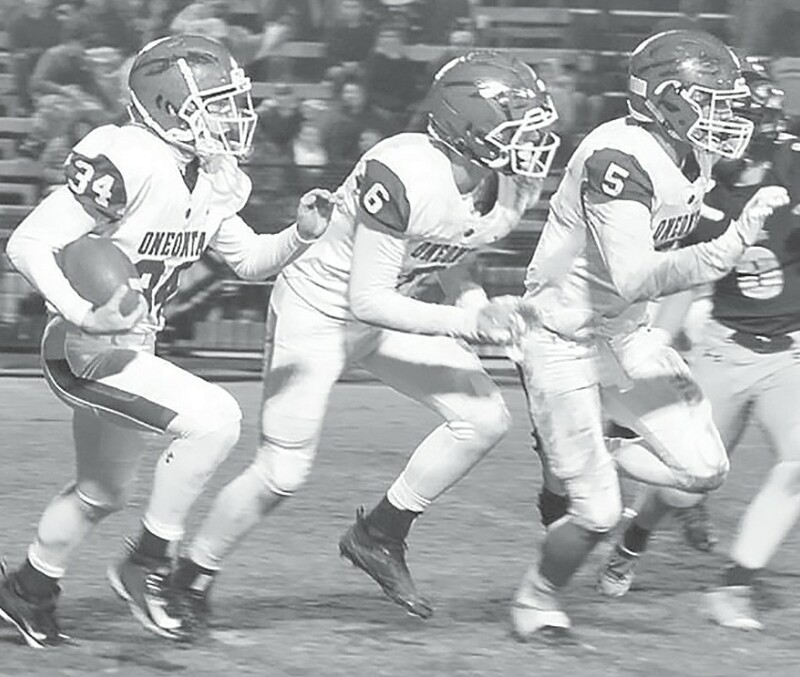 Oneonta ended its regular season on a high note by defeating J.B. Pennington 28-21. Statistically, the two teams were evenly matched. Oneonta barely edged Pennington in total yards, collecting 354 yards to Pennington’s 330. Takeaways proved to be the difference as Oneonta forced Pennington to turn the ball over three times. Oneonta jumped out to a 7-0 lead in the first quarter on Hill’s 80-yard touchdown run. Pennington responded in the second quarter on a four-yard touchdown run by Luke Cassity to even the score at 7-7. Hill then scored again, this time from one yard out, and Oneonta went into halftime leading 14-7. Oneonta extended its lead to 21-7 in the third quarter on a 67-yard pass from Hill to Brandon Howard. Pennington kept fighting. In the fourth quarter, Pennington closed the gap to one score after Noah Allison connected with Cole Littleton on an 18-yard touchdown pass. Just as Pennington got within striking distance, Oneonta answered with a three-yard rushing touchdown by Hill to further extend its lead to 28-14. The final touchdown of the game came on an 11-yard pass from Allison to Jaxon Bullard, but it came too late. Oneonta ran out the clock to seal the victory. Hill led the way offensively for Oneonta going 7-of-16 passing with 172 yards and one touchdown. Hill also ran the ball 16 times for 116 yards with three touchdowns. Brandon Howard had two receptions for 67 yards and a touchdown. Jaden Kent had three receptions for 78 yards. Luke Hodge and Beau Ragsdale set the tone on defense with 15 tackles each. Ragsdale also had a fumble recovery. Howard and Kent each had an interception. Allison completed 16-of-28 for 210 yards and two touchdowns. Littleton had seven catches for 93 yards and a touchdown. Sheldon Blythe had 74 rushing yards. Defensively, Cassity had 10 tackles including two for loss. John Williams also made two tackles behind the line. Bullard collected eight tackles. J.B. Pennington drops to 5-5 on the season. They will play at Susan Moore (8-2) Friday night for the first round of the state playoffs. Oneonta improves to 7-3 and will travel to Brooks (8-2) this Friday for the first round of the state playoffs.